Vitamins are an essential nutrient for the body. They are typically absorbed in large quantities from foods like fruits, vegetables and seafood, but are present in just about every type of food. There are two types of vitamin, those which are soluble in water and those which are soluble in fat. The fat-soluble ones can be stored by the body in fat cells and kept for later use. Water-soluble vitamins are transported by the blood stream as soon as they are absorbed and are used immediately, and must therefore be gotten every day to ensure a constant supply. Vitamin A is one of the most well-known vitamins. It boosts eyesight, improves cell structure, promotes natural growth of the body and increases the appetite. Good sources for vitamin A include yolks of chicken eggs, milk and milk by-products, yellow fruits like bananas and lemons and fish-liver oil and other animal livers. Fatty fish such as tuna, salmon, herring and sardines, sunlight, eggs, cod liver oil and milk products are all great sources of vitamin D. This vitamin strengthens the bones (including the teeth) and allows for efficient absorption of phosphorus and calcium via the digestive system. Vitamin E is generally found in whole grains, oil from vegetables, leafy green vegetables like lettuce and spinach, various types of nuts, eggs and soy beans. Vitamin E has potent antioxidant qualities and is necessary for red blood cell production and proper functioning of the brain. An essential mineral in the body, vitamin K is required for blood clotting as it helps the body to produce prothrombin. Vitamin K is mostly found in milk products and vegetables like cabbage and lettuce. Vitamin B1, also called thiamine, aids the nervous system and helps the body in breaking down carbohydrates as well as general digestion and repairing tissues damage by alcohol. Peanuts, beans, milk, pork, brown rice and other whole grains all contain thiamine. Riboflavin (vitamin B2) is found in dairy products, various meats, fish, leafy vegetables and in yeast. Is is essential for the skin, hair and nail growth as well as for the proper digestion of fats, proteins and carbs. It also aids the body in producing enzymes and helps prevent ulcers and sores. Blood circulation and nervous system functions require niacin, the B3 vitamin, as do the production of various hormones like insulin, testosterone, oestrogen and cortisone. Vitamin B3 is usually found in non-fatty meat, poultry, whole grains and fish. Vitamin B6, or pyridoxine, aids the body in maintaining ideal sugar levels in the blood and is required to make haemoglobin. It also reduces the risk of nerve damage and skin disease and is contained in bananas, fish, pork, whole grains, wheat, yeast and chicken. Vitamin B12 is used by the body to facilitate the production of red blood cells, nerves and cellular genetic composition. It also helps in the digestion of folic acid and carbohydrates. Vitamin B12 can be found in eggs, fish, beef, pork, eggs and milk. Vitamin C, found in berries, citrus fruits and most types of vegetables, improves the body's immune system and it increases cellular longevity, eliminates the cholesterol and plaque and helps to heal the wounds quicker. 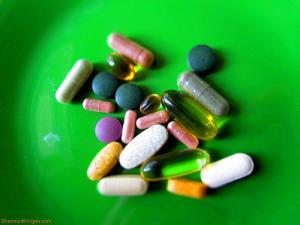 All of the above vitamins are essential for the proper functioning of the human body. A deficiency in any one of them can be quickly noticed, but it would not be easy to determine which one is lacking. A doctor should be able to determine this and prescribe the correct medication for treatment.